Acting on the laws of nature, the EarthBox facilitates the movement of nutrients from areas of high concentration to areas of low concentration. When the EarthBox is set up, the fertilizer stripe is placed on top of the potting mix-creating an area of high nutrient concentration. At this time, the potting mix around the roots of the growing plant has no fertilizer. When water is added, the moist potting mix slowly conducts the diluted nutrients down the concentration gradient to the plant roots,which absorb optimal amounts of nutrients at any given time. The EarthBox’s plastic cover drastically reduces the water evaporation rate and returns condensed water vapor to the potting mix. As the plants draw water from the reservoir, they consume only what they need to stay healthy. Plants cannot be over-watered or under-watered if the reservoir is kept full. The plastic cover also prevents fertilizer from being diluted or washed away by rain. Many of our customers have come back to us asking for refills, and this year we will have them! We are stocking the Organic Kits and Replant kits! New Coolaroo Shade Sails for your yard! Fun, Colorful, Shade Sails coming this Spring! These lively jolts of color can be easily installed to transform any yard into your backyard oasis! Sometimes exterior design calls for subtlety. Sometimes boldness is required. For those latter occasions there are the Coolaroo Shade Sails. Coolaroo shade sails are not your grandparent’s patio umbrella. They look bolder than that, brightly colored in square and triangle shapes. It’s remarkable how one lone shade sail can lend an outdoor space a contemporary touch. String up a group of shade sails and you can transform a space into something you’d expect to find at a modern art museum. What you can’t see from the photos is how durable the Coolaroo material is. This isn’t like hanging out a sheet. The shade sails are made for life outdoors. The sail’s nylon edges will not tear or fray. The color of the material will remain bright even when permanently hung outside and exposed to moisture, intense sun and temperature extremes. The D-rings on the corners of the Coolaroo will stay anchored to the included stainless steel poles. And it isn’t just Spot Cool Stuff saying so—Coolaroo products come with a 10 year warranty. If your shade sail becomes damaged the company will replace it for free. Garden Color in an instant! 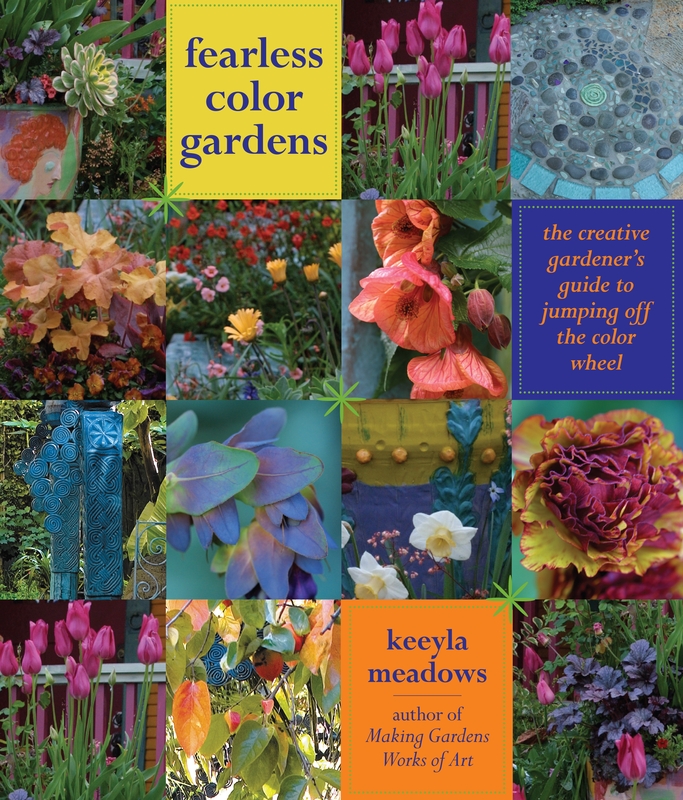 I saw Keeyla Meadows when she was promoting her first book at the Northwest Flower and Garden Show in Seattle a few years ago. She presented a seminar there about using color in the garden. We all sat there waiting for her to spill out something that we could take home with us that would make our efforts look even 1/100th as over the top as her creations. She taught me one very important thing. It hit home and continues to be one of my secret weapons in the garden. She said in her talk, ” the fastest, least expensive way to add COLOR to any garden is with PAINT! …After that, I have never been able to walk past the MIS-MATCHED paints in Home Depot or Lowes without checking to see if they had some beautiful color that I needed for something magical that I might paint some day. My son and I started transforming the Garden Center yesterday. We started by adding a fresh coat of white to the main walls and shelves in the gift shoppe. Today I moved forward and went crazy with a beautiful, natural shade of Grey on 3 tables, one shelf and 2 crates and made a “new” corner to display some new products on order. Tomorrow I am moving on to the good stuff…Coral and Lavender and Turquoise! It has been a long winter and I have been COLOR Starved! I am in Heaven with my$ 3.00 gallons of paint and a roller and a brush! When I get done painting everything in sight, I will reward myself with a copy of my Favorite Garden Artist’s newest book! 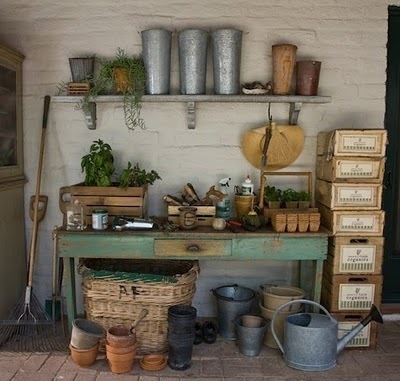 I want a kitchen Garden like this one! I am not sure who created it, but it looks too good to be true. If you recognize the Lady in the garden, and think she looks pretty good, too, you would be correct! 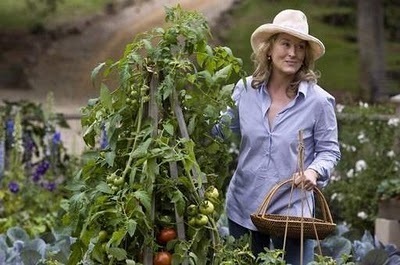 It is Meryl Streep, from the movie “It’s Complicated”. I haven’t seen this movie yet, but I would see it now just to see the gardens! The potting shed is pretty nice, too! I wonder what other great recycling ideas are out there using items that would normally end up in a landfill. Please post any photos you want to share. 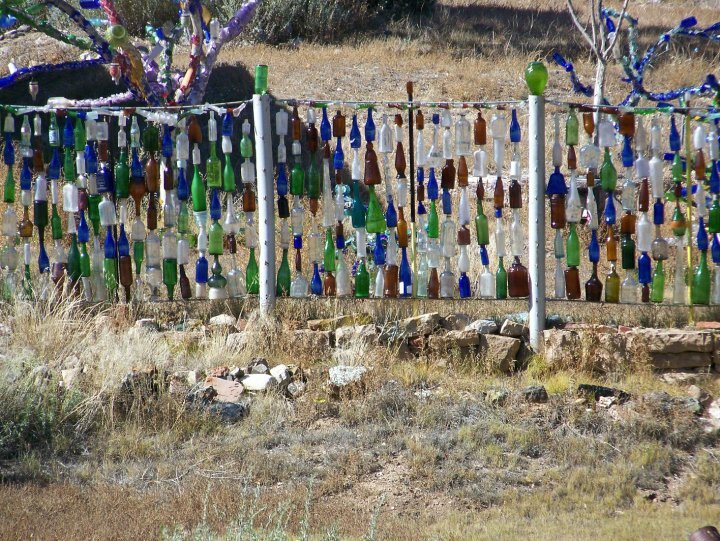 This idea really was exciting to me because our local Transfer Station Does Not Recycle Glass! I tried to turn in some bottles, and they said to put it with the regular trash going to the landfill! Ever since then I have been trying to think of something to do with all of those bottles…Here is my answer. Garden Art!